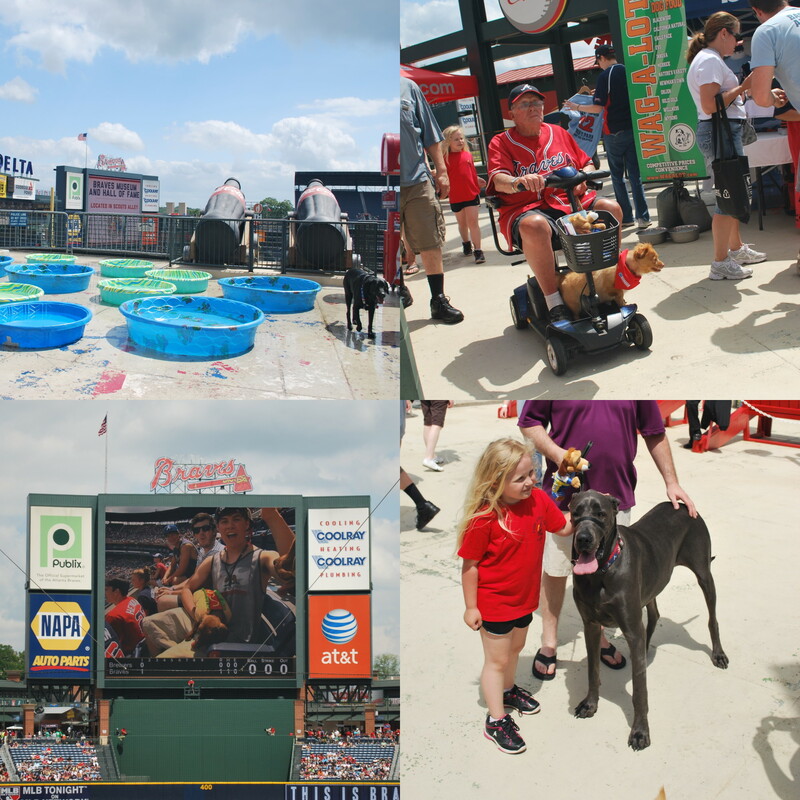 We had time to kill, and it was Bark in the Park day!!! Annette and Dave have two dogs, who I alluded to in the 4-13-12 post. Annette had badly wanted to bring them, but decided otherwise. One of their dogs is somewhat skittish, and the other gets car sick, so it was probably for the best. We spent a good 30 minutes in the area that is reserved for the dogs and their owners. The Braves have a special entrance and everything, and the dogs have to stay in that area for the whole game, so it’s not like there were dogs everywhere. I took a bunch of pictures and below is a four-parter that shows what all went down. 1) Kiddie pools set up for the dogs, for when they inevitably get too hot in the Atlanta sun, along with a Black Lab on the right. 2) A Chihuahua mix (or so Annette says) on a scooter with its owner. 3) A Great Dane, and this picture does not do it justice. That girl was six feet tall… Ok, maybe she wasn’t six feet tall, but the dog was enormous. A cocker spaniel was going bananas and trying to get off its leash to attack him. I’m not quite sure who would’ve won the fight, but my money is on the Great Dane. 4) A Wiener Dog… dressed up as a hot dog… eating a hot dog. They showed it on the jumbotron at some point during the game and it was hilarious. The camera was zoomed in on the dog, and there was a hand (maybe the camera man’s) holding a foot long hot dog. They kind of played tug of war for a bit, but the wiener dog wound up eating the whole thing, good stuff. During half innings they would show various dogs while playing Snoop Dogg songs from the nineties. The Braves did a great job of combining pets with old school west coast hip-hip. Nicely done! After spending some time in the Bark in the Park zone, or whatever they were calling it, if anything, I still had some time to kill. I wandered and took some pictures, including one of the Atlanta skyline. 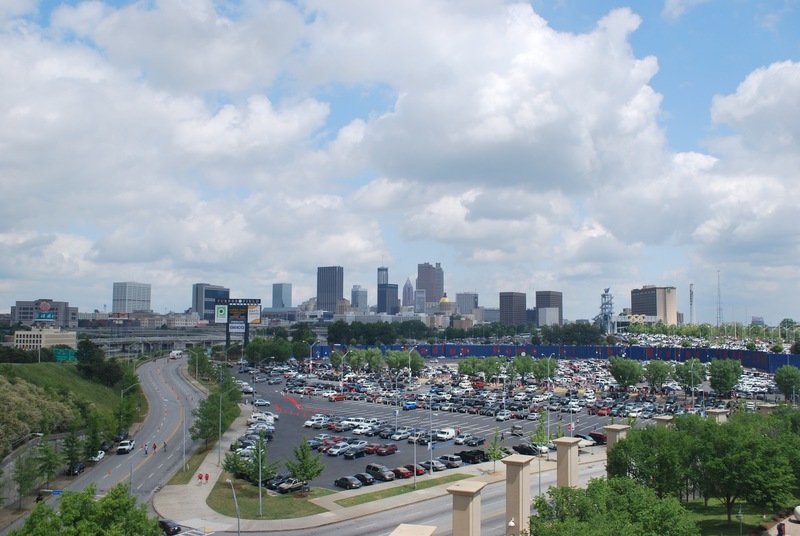 You can see more of the exterior of Atlanta Fulton County Stadium that I alluded to yesterday (the blue wall with red lettering). You can also see the commemorative Olympic torch on the right, with the Olympic emblem to the right of that. 1) A massive Chick-fil-A cow, with the sign reading “Choppin Makes U Hungree 4 Chikin”. I don’t think I’ve ever eaten at a Chick-fil-A, so I should probably do that before my flight leaves tomorrow night. 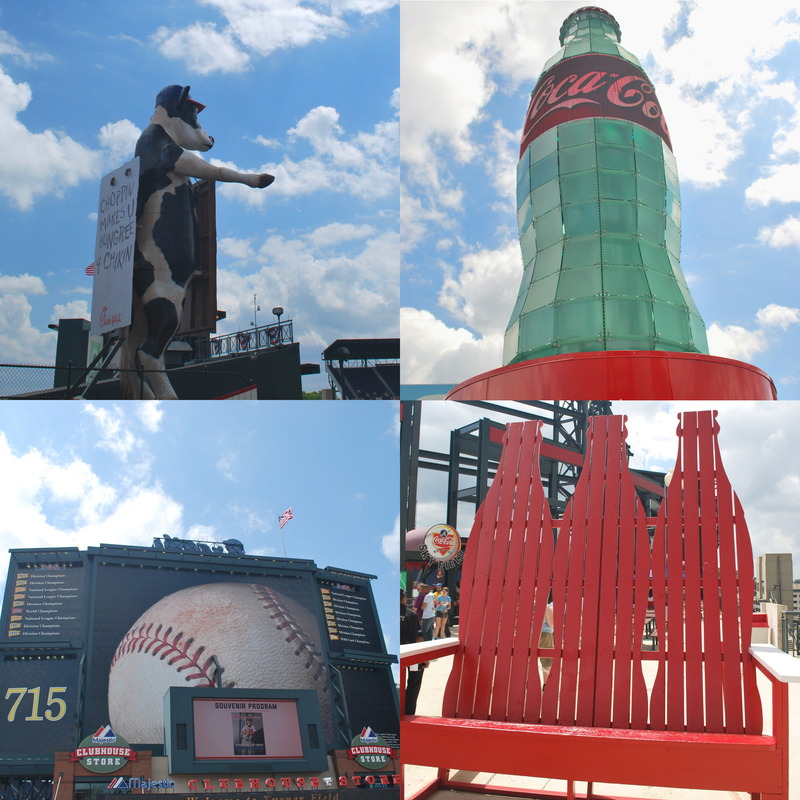 2) A giant Coca-Cola bottle, the Coca-Cola part is actually a cylindrical LED board, and it does other stuff other than just display “Coca-Cola”. 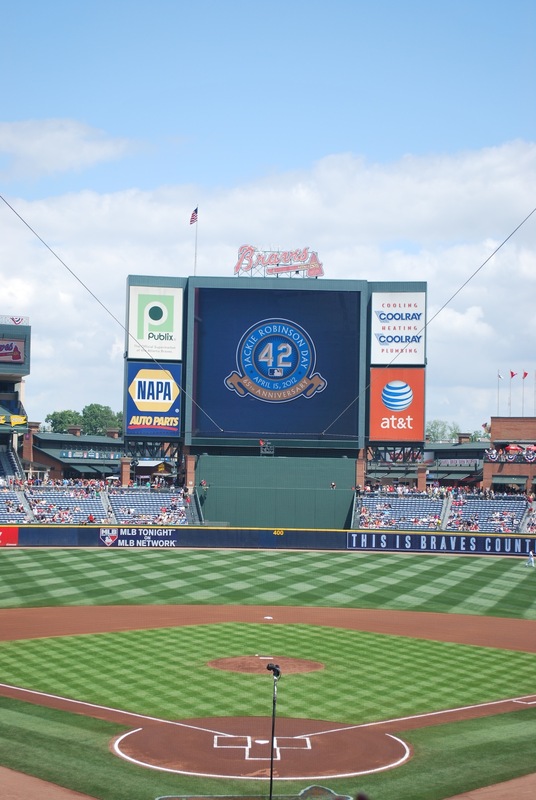 When the Braves play their iconic chopping music, an axe is shown chopping, which is also being shown on other LED boards throughout Turner Field. 3) Red Coke bottle chairs. I would say the bottles themselves are about six feet tall, so the chairs are rather large. 4) The back of the scoreboard in centerfield. I just like it because it had a enormous baseball on it. I also took a picture of a staircase that leads from the field level all the way up to the upper deck. There are actually another 30 or so stairs that are not pictured, maybe more. 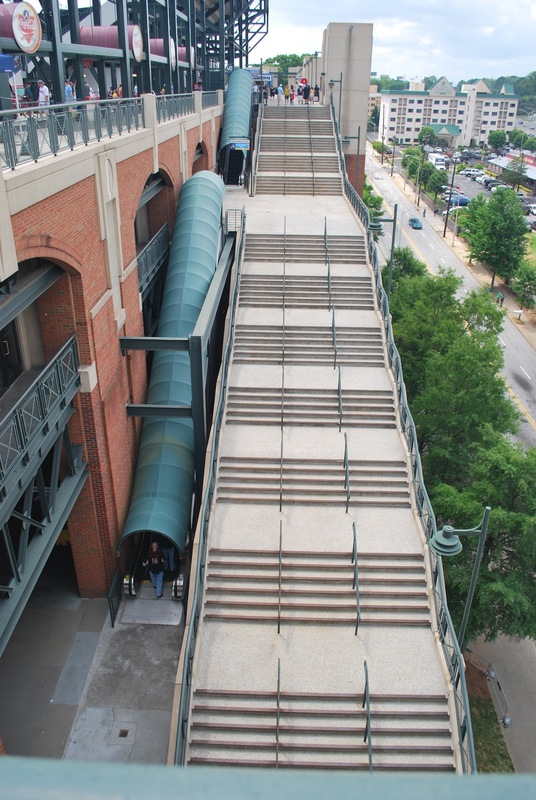 I took the picture from the left field concourse in the upper deck, and there’s a walkway that looks over the staircase. I would run those every day if I could. I don’t really like running, but I’ve always liked going up stairs, and take them whenever I can. On my way to my seat I came across a wall in the second level concourse that commemorated the three cities that the Braves franchise has played in; Boston, Milwaukee, and Atlanta. When they were in Boston they actually started as the Red Stockings in 1871, then the Red Caps, Beaneaters (my favorite), Doves, Rustlers, and finally the Braves (in 1941). 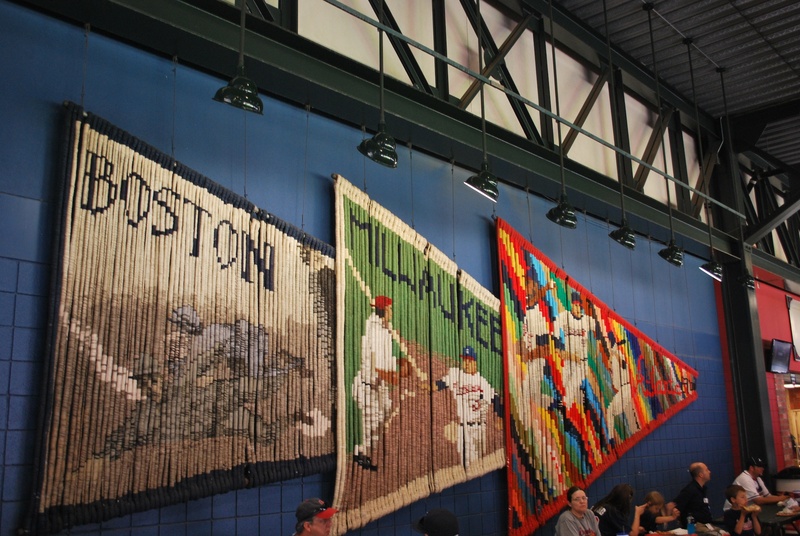 I’m not sure what the giant pennants were made of, but I’m guessing wool or something similar. I was in my seat by 12:55 for what I thought was the 1:05 first pitch, I was curious why they were doing some of the things they generally do 30 minutes before the game. I’m an idiot. Before the 1:35 first pitch they showed a video on the board commemorating Jackie Robinson breaking the color barrier 65 years ago. I thought it would have been a longer video, but it was just some footage of players, with someone saying, before Kemp, before Aaron, before Mays, there was Jackie. They listed more players than just the three I mentioned, but that was the gist of it. The view from my seats for today’s game, it looks like I was sitting closer than I actually was, I was in the fourth row of section 202, and I think the section between mine and the field had about 30 rows. The game started and the Braves took an early 1-0 lead. The Brewers tied it with the help of a two base error on their left fielder, and it was even at a run a piece. My optimism was soon diminished with Chipper Jones’ three run home run in the bottom of the third. The Braves added one in the fourth and two in the eighth to build a 7-1 lead heading to the ninth. The Brewers pushed three across in the ninth, including a two run home run by Jonathan Lucroy. When he connected a guy two rows back said: “Yes!! Easy out”. It was clearly hit very well and landed about ten rows deep in left center. I turned as it was clearing the fence and said; “yeah, easy out of the park”. He chuckled a little, but then a guy a few seats next to him, who wasn’t with the guy, said “SCOREBOARD!”. I told him that I know the Braves were about to sweep us, I was just questioning the other guys’ ability to correctly judge a fly ball. I was really hoping the Brewers could have somehow won after that, but it wasn’t in the cards. If “Scoreboard” is all he has in his arsenal, I’m fearful that he’s not going to win many arguments. A sweep on the road is never fun, but I played it off like I wasn’t devastated, as to not draw attention, and more ridicule. I missed three pitches at this game! I’m disappointed in myself. The first was the 1-0 pitch to Chipper Jones in the first inning, ending my streak at 611 consecutive pitches. A Brewers fan was taking pictures in the cross aisle in front of me and I was mad that he was just standing there, not aware that he was blocking other people’s view. He really wasn’t in my way, but he was in other peoples’ way and that’s one of my biggest pet peeves. That’s what the two and a half minutes between innings is for. I also missed the first pitch to Pastornicky in the bottom of the fourth. Jason Heyward had just homered right before Pastornicky’s at bat, and I was still reading stuff on the scoreboard. I also missed the very last pitch of the game! I was getting my stuff gathered and looked up as the final pitch hit McCann’s glove, ending the game with a Kottaras strikeout. I wanted to get out of there quickly so I could meet Annette, Dave, and Bill at the car, and not get stuck in traffic. When I realized I missed it I was kind of shocked, because it all happened so fast, but it’s bound to happen. I’m looking forward to the nine game home stand, hopefully the Crew can turn things around! Hope you made it to Chick-fil-A. It is delicious. Ah I reminisced in your photos. 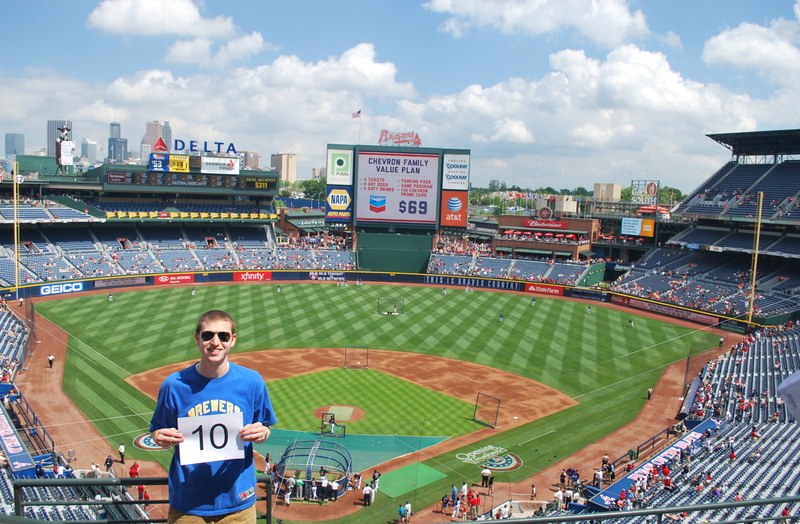 I miss Turner Field so much. Did you notice the cow does the tomahawk chop? No. I tried to avoid looking around during tense moments. And the chopping usually occurs during those times, so I must’ve missed it.